That's it, Actinomycetes and Actinobacteria (class) are synonyms! 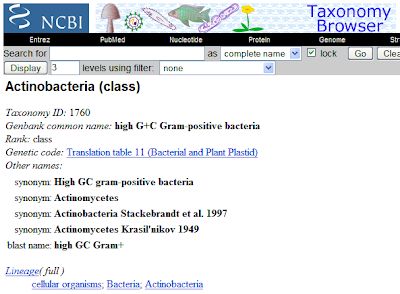 So, if we search for "actinobacteria" at the NCBI Taxonomy browser, we will arrive to the same "Actinobacteria (class) = Actinomycete" entry, right? Nope! We come to a different place called: "Actinobacteria, phylum, actinobacteria". Oh, I see, the "Actinobacteria (class) = Actinomycetes" is just a part of a greater Actinobacteria (phylum). If interested, you may visit the List of Prokaryotic Names with Standing in the Nomenclature and search for both words. It seems that "Actinomycetes" was the old name for the class, and was later replaced by "Actinobacteria" (is this correct?). My two cents? For most practical uses, I guess we might use the words "actinomycetes" and "Actinobacteria" (class or phylum) as synonyms. Further precision will be needed when discussing on nomenclature, taxonomy or phylogeny. Or when talking about those Actinobacteria not belonging to the Actinomycetales (order). Except where otherwise noted, blog posts by Cesar Sanchez in Twisted Bacteria are licensed under a Creative Commons Attribution 3.0 Unported License. Please let me know if any quotes or images on this blog are improperly credited. E-mail: TwistedBacteria AT gmail DOT com . Social media icons by Oliver Twardowski and AddThis.